In response to the call of The Association for Friends of African Baseball (AFAB), a non-profit organization certified by the Japanese Government, Baseball Federation of Japan and its affiliates as well as many individuals in Japan are sending donations of baseball equipment to AFAB in Tokyo who will send them to Tanzania in June, 2012. Shinya Tomonari, senior representative of JICA (Japan International Cooperation Agency) in Tanzania and former Ghanaian baseball squad in West Africa, devotes his time outside his regular job of assisting with medical care, agriculture and maintenance of infrastructure in African countries, to help develop baseball in African countries including Ghana, Uganda, Brukina Faso, Kenya, Zambia, South Africa and Rwanda in his capacity as President of AFAB. Major donors in Japan include High School Baseball Federation, Rubber Baseball Association, Amateur Baseball Association and Tokyo Big-6 League where Shinya played as an infielder with Keio University’s Baseball Club. 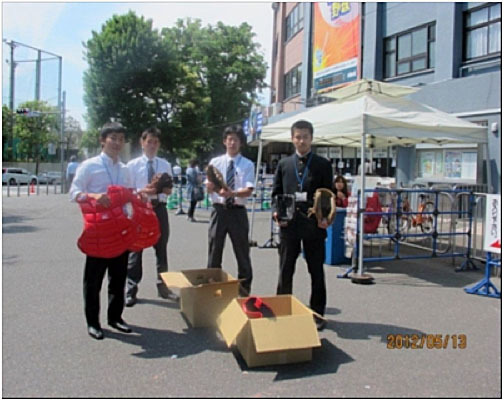 Pictured at the Meiji Jingu Baseball Stadium where Spring Tournament of Tokyo Big-6 is in progress, college student officials show the donation from the six universities’ ball clubs. Since last February, Tomonari has been in close contact with National Sports Council and hopes to start a high school baseball team first in Dar es Salaam followed by other States in Tanzania, and participate in the African Games in 2015.